Let’s talk about attack, defense, and safety in chess: three key principles of your chess strategy. In the previous lesson, you have learned what is an exchange in chess and what is a fair exchange. But mind: sometimes an exchange is good for you, other times is good for your opponent. 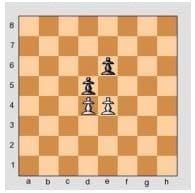 If we play Capture the Flag, should White exchange his pawn capturing in d5? Or should move to e5? Making the right decision makes the difference between winning and losing. If White exchanges his pawn in the game above, White loses. Black captures the pawn back and White gets blocked. If White moves in e5 instead of exchanging, White wins as Black gets blocked. How to understand when an exchange is good or not? 1) in principle you should take a free pawn if you can (a free pawn means that your opponent can’t capture back any of your pieces). This is an ATTACK move. 2) if your opponent is trying to take a pawn for nothing you should do something about it. This is a DEFENCE move. 3) you should avoid playing moves that give your opponent a free pawn (unless you’ve looked ahead and worked out that you can win by doing so). This is a SAFETY move. Attack, Defence and Safety are three key principles of your chess strategy. Every time you move, you should always keep them in mind. Do not move random, but try to attack, defend or make your pieces safe.